This entry was posted in AL-QAEDA IN THE ISLAMIC MAGHREB(AQIM), ANSAR DINE, ARMED CONFLICT, CHAD, COUNTERINSURGENCY OPERATIONS, GLOBAL DEFENCE NEWS, MALI, MILITARY HARDWARE, NIGER, RELIGIOUS FUNDAMENTALISM, RISK ANALYSIS, SECURITY ISSUES AND CONCERNS, URBAN GUERRILLA WARFARE. Bookmark the permalink. The Black Scorpion looks good to go for urban warfare against guerrillas. Compact and maneouvreable, it reminds me of our pending order for Oshkosh SandCat Protected Patrol Vehicles. Looks like the Mahindra Marksman as well. The MOPOL also use a similar Streit Cougar Mk.II protected Light Patrol Vehicle without this useful panoply of armaments. The ACMAT Patsas is just as good to go. Great, task-specific assets. 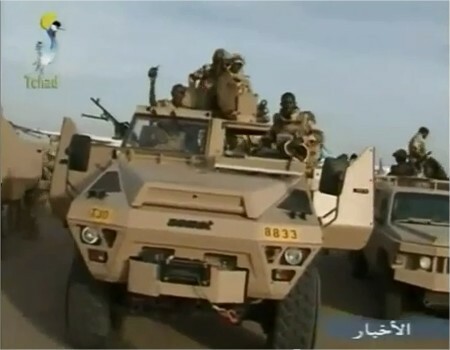 It shows that even the Chadians, long accustomed to running around in Toyota 4×4 trucks armed with HMGs, mortars, MRLs and RCLs realise the inadequacy of fighting in soft-skinned deathtraps. In Nigeria where we have been dumping thousands of soft-skinned Ford Ranger, Toyota Hilux and Mitsubishi 4WDs on defence and security forces even in the face of Africa’s most IED-intensive conflict, we might need to look again at the option of getting ONE protected vehicle such as this Black Scorpion instead of two 4WDs, for the military units on CTCOIN operations. It increases battlefield survivability and in any case, for the numbers of 4WDs specifically handed to the NA alone since 2008, we could easily have amassed over a thousand Black Scorpion-type protected vehicles by now. We really should use this as a platform which we can get PROFORCE Nigeria to reverse engineer as is – turret and weapons. If PROFORCE can get this done for US$30,000 apiece, the FG can acquire 200 units of Toyota LandCruiser and have them reconfigured for CTCOIN operations. The black scorpion is a true beauty. We could supplement some of these with our large fleet of otokar’s. Just like the otokar, the scorpion looks very manoeuvrable too. Very good for urban combat guerrilla warfare. Instead of this rash of soft-skinned 4WDs, let us have something like this as the bottomline for CTCOIN operations. Some state governments give as many as 100-150 Toyota 4WD vans to defence and security forces active within their states in ONE year. A better way of going about this would be to ask all states to make a one-off contribution of US$0.5 million each as a special CTCOIN infrastructure levy deductible from the Federation Account at source while the FG add US$10 million. Assuming that each of these Fast Attack Vehicles costs US$55,000-60, 000 apiece, with US$28 million we can acquire, depending on whether it is a MOPOL/ATS troop carrier or a military combat vehicle, we can acquire 500 units of these. Each state+FCT Police Command would be given eight units riot control and APC variants for MOPOL and ATS units. That makes 296 units out. You know OGA beeg, the 4WD hilux is still/ would still be indispensable, looking at those numbers, they are still very few. You still need something light and very fast for hot pursuits. However it would be nice to up armour the 4WD so that they can be able to with stand light ballistic fire, while still maintaining it’s fluidity. The company in ogun state, can do the job. I’ve seen many of their vehicles, up armoured down here, but not in enough quantity. The numbers above would definitely not be enough. Honestly speaking, Nigeria needs to fix the practice of putting our brothers in soft-skinned 4WDs. I recently told a friend (Lt. S…) attached COIN/CT Operations in Bauch that NA is doing comedy of errors with such practice in the face of IEDs by unthinking BH. Boss, as you rightly observed, we really should, by now, be engaging this PROFORCE Defence Guys to spur indigenous Defence Industrialization in Nigeria. Although I don’t know the cost implication ( I can see you talk about fixing a noted challenge with US$30,000), but definitely Proforce that is in Nigeria can be prevailed upon to beat the prices of procurement from abroad, while still ensure the best world class Defence standard. In fact, what I saw them manufacturing for Osun State Government (Which I saw in Ile-Ife recently) convinces me that Nigeria’s glory in Defence Industry has come. Believe me Oga Beeg, PROFORCE APC that I saw in Ile-Ife was built on Toyota LandCruiser and obviously reconfigured for CTCOIN operations. II can’t believe this is being manufactured in Nigeria and yet we put our Officers and Soldiers in soft-skinned 4WDs. Think our Generals, Marshals and Admirals at the DHQ should do something fast. And my take is: Let the Armed Forces, especially the NA work hand-in-hand with these PROFORCE Guys in the area of R&D and let us develop something great for NIgeria. Thank you OGA, proforce is the company I had in mind. Oh certainly, I am just talking about a start-up haul. At this phase, I expect that for convoy travels – two of these would serve as pilot and sweeper for a convoy of five 4WDs. What it would immediately achieve is that three 4WDs never again have to set off on their own. These Black Scorpion FAVs could be used to complement holdings of Otokar Cobra and Panhard VBL in-theatre being uparmoured and kitted for combat. Remember, it would only take US$0.5 million and US$10 million on the part of state govts and the FG to get started. If they place orders bi-yearly, that still does not take a lot from any of the governments. Do not forget the ALGON Prado jeeps episode where money was deducted from all the LGAs at source and the SUVs were brought in from Malaysia. If the FG mean this, they can also liaise with ALGON(Association of LGs of Nigeria) and deducted 9 million naira from the quartely allocation of each of the 774 LGAs. With that, they can rake in an additional 774 units of Black Scorpion FAVs. Either way, this is attainable and at maximum convenience to everyone IF only we prioritise. They have done it before with the ALGON Prado jeeps. Lagos State’s LGs continue to levy themselves for similar reasons and have provided over 400 vans, 30 armoured troop carriers and two large Bell helicopters to the State Police Command, free of charge. So imagine if the states stepped up to US$1 million each and the FG add US$10m. That would yield 700 units of Black Scorpion FAVs. Take it down to the LGs each throwing in US$55,000 to the ALGON purse and that fetches another 774 units. If we know what we are doing, we could absolutely plug any gaps in our CTCOIN fleet this year. The Oga of PROFORCE is one of us here. If the FG can acquire 250 Toyota LandCruiser 4WD vans. 75 units of CIS-50 12.7mm HMG and 175 units of GPMGs and agree on a reconfiguration fee of US$30,000 apiece, PROFORCE can reverse engineer this Black Scorpion as the “Strike Eagle” for Nigeria. Thank you, Bola and good to see you again. I saw those RED-coloured PROFORCE uparmoured vehicles on NTA News at the time when they were launched and I have to say that they looked good. The Sri Lankans did a lot of improvisation during their war with the Tamil Tigers. 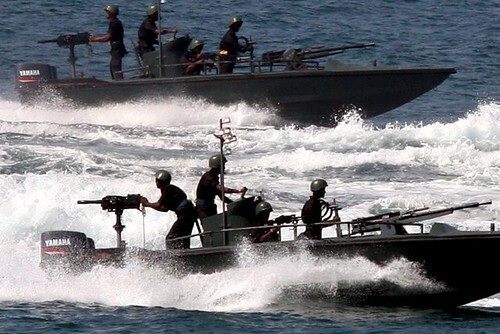 One of these was the 6 metre Arrow Boat – produced for less than 20k dollars but they had 23mm cannons, .50 calibre HMGs or GPMGs and were used for swarm tactics to protect shipping and to confront suicidal Sea Tiger terrorists. It worked so well. We can cheaply reverse engineer the Black Scorpion FAV in partnership with PROFORCE and saturate the conflict zones with protected battle vehicles. 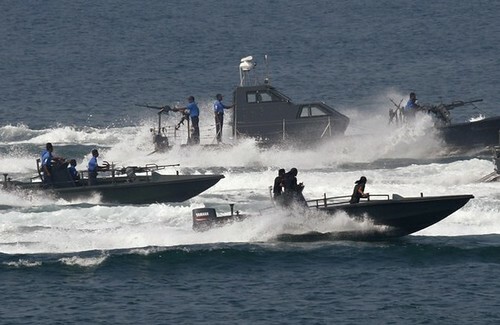 Anyway, read about the impact of the marine equivalent – Arrow Boats and the impact they had in maritime CT operations. Classic swarm tactics used to ward off Sea Tiger suicide boats. These 6m little boats were so well armed, many carried 23mm cannons while some had 12.7mm or twin-barreled 14.5mm HMGs as main weapons and over 100 units were built. 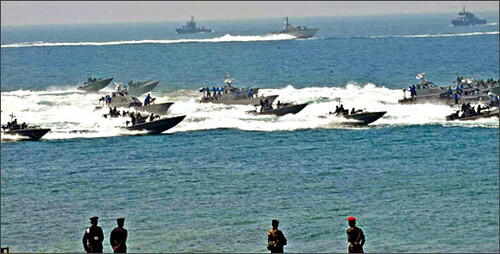 In the background, Israeli Shaldag/Dvora-type Fast Patrol Craft and the reverse engineered Shaldag – the Colombo FPC can be seen patrolling very close to shore.